Sport is an important part of Czech culture. It is a strong source of patriotism. The two most popular sports in the Czech Republic are football and ice hockey. They both get the most attention from both the media and the public. The many other sports with professional teams in the Czech Republic include basketball, volleyball, handball, athletics, floorball and others. The sporting events considered the most important in the Czech Republic are the Ice Hockey World Championships, the Olympic ice hockey tournament, the European football championship, and the football World Cup. In general, any international match involving the Czech national ice hockey or football team draws attention, especially when played against a traditional rival: Germany and Slovakia in football; and Russia, Finland, Sweden, Canada and Slovakia in ice hockey. 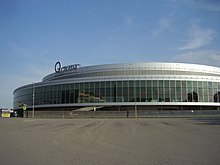 O2 Arena in Prague was built for the 2004 World Championships. The Czech national ice hockey team is one of the most successful teams in the world. It regularly competes in the World Championships, the Olympic Games and the Euro Hockey Tour. The national team won their first Olympic Gold medal at the 1998 Winter Games in Nagano. The Czech team won six World Championship medals between 1996 to 2011. The highest-ranking ice hockey competition in the Czech Republic is the Extraliga. Famous Czech players include Jaromír Jágr, Dominik Hašek, Patrik Eliáš, Aleš Hemský, Tomáš Kaberle, Milan Michálek and Robert Lang. Football has been a popular sport among Czechs for many years. Previously the old Czechoslovakia team were a strong team internationally. In 2006, the Czech national team qualified for their first World Cup since the break-up of Czechoslovokia. More recently players such as Petr Čech, Tomáš Rosický and Pavel Nedvěd have achieved great success at top European clubs and have become national icons. American football began to be played in the Czech Republic from the 1980s. The Czech Association of American football (Česká asociace amerického fotbalu) was created in 1994. Since then it has developed a league system that is divided into two divisions: ČLAF A and ČLAF B. The most successful team is Prague Panthers, whom have won 12 titles. The A7 series is an independent league. It was created for small and rookie teams. It is 7-on-7 football. The final match of the season is called Rice bowl. A7 series is less expensive than ČLAF so it can play teams from small towns which don't have sponsors. Baseball is growing in popularity, but is still a minority sport. The Czech Republic hosted the Baseball World Cup in 2009. Cricket has been played in the Czech Republic since 1997. It joined the International Cricket Council in 2000. Rugby union was introduced to Czechoslovakia by Josef Rössler-Ořovský in 1895. Czechoslovakia was a founder member of FIRA in 1934, and joined the IRB in 1988. The sport is mostly played in Brno and Prague. A national Australian rules football team represents the Czech Republic in international tournaments. In 2009, they came second in the Australian Rules football European Shield. Shooting is the third most popular sport in the Czech Republic. Winter sports are also very popular. The country has hosted world championship tournaments for Nordic skiing, ski jumping, and luge. Several Czech competitors have won medals in these kinds of sports internationally, including at the Winter Olympics. The Czech Republic hosts several tennis events each year, including the UniCredit Czech Open in Prostějov and Prosperita Open in Ostrava, the Sparta Prague Open and Strabag Prague Open in Prague. The best Czech tennis players include Tomáš Berdych, Radek Štěpánek, Martina Navratilova and Petra Kvitová. ↑ Jagr Scores 1,600th Point in Return. Associated Press via The New York Times (7 October 2011). ↑ (Czech) Kyša, Leoš (28 January 2011). "Počet legálně držených zbraní v Česku stoupá. Už jich je přes 700 tisíc". Hospodářské noviny. Czech Republic. Retrieved 28 January 2011.